This comes with one bulbs and is in excellent working order & condition. 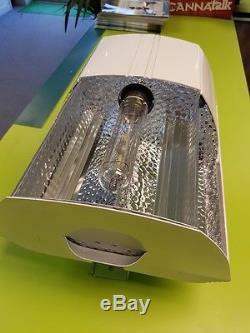 Latest model luminaire from Philips for professional horticulture. Philips answer to the full spectrum plasma lamps. Much more reliable, more efficient and more light per watt than LED, Plasma and conventional horticultural HPS lamps. The light is equipped with a digital ballast and an open high efficiency reflector made from highly reflective aluminium VEGA. Full spectrum daylight lamps including UV and deep red. Very high system efficiency of 1.90 mol / W. Very solid Philips electronic ballast, with an average life of 50,000 hours with a survival rate of 90%. 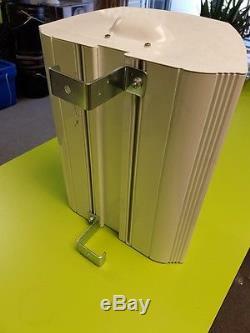 Open reflector made of very high quality ultra reflective VEGA ® aluminium. Input voltage: 220 to 240 volts (line-neutral). Input current: 1.5 Amp at 230 Volts. Reflector material: high efficiency reflector VEGA aluminium. Luminous flux: 36,000 lumens. PPF Daylight: 540 micromol / s. PPF Agro: 600 micromol / s. Philips has developed this unit to convert as much energy as possible into light for the crop. To ensure this, they have developed a reflector with a yield of no less than 92%. This means that of the total light that comes out of the lamp, 92% actually reaches the crop. Because the light is reflected in different ways, the light also penetrates further into your crop. The D-Papillon is a fitting with a compact aluminium housing. In addition to allowing maximum light dispersion, it is also finished with a reflective white coating. So any light that is blocked by the fitting is reflected back into the growing environment. Most growers are not aware of how important it is to keep the aluminium reflectors clean, to maximise the output of your lamps. Because this is so important Philips have made sure that the reflector is easy to clean. The reflector part can be slid easily into the housing; so the regular cleaning of the reflectors is a straightforward affair. Philips also guarantees a maximum permanent decay of the reflector of only 10% over the 10 year life. In order to make a comparison with the plasma lamp. Plasma Lamp: 300W Input, 300 micromol / s output. 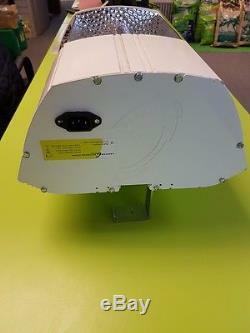 Daylight lamp: 350W Input, 600 micromol / s output. The D-Papillon 315W is equipped with an electronic ballast and an open high efficiency reflector made of highly reflective aluminium VEGA ®. The D-Papillon can be used with both the Agro lamp and the Daylight lamp. Expect at least 33% savings on energy costs as compared to conventional horticultural lighting. The Daylight lamp is optimized in a wide spectrum grow light with increased proportion of blue and very suitable to replace 100% HPI-T situations. (germination, propagation, and vegative and pre flowering cycle). We Sell all New & Used Hydroponic Equipment including soils, pebbles, nutrient feeds etc. 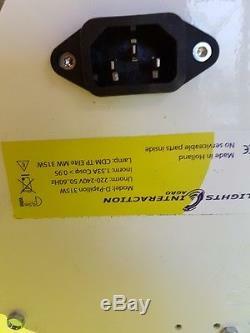 Many different brands available Metal & Plastic Ballasts Maxi Bright, Sun master, Eurolux POWERPLANT Lumii etc. All kits can be changed or upgraded at an extra cost. The item "Hydroponic D Papillon 315W Daylight CDM Full Spectrum Grow Light System Kit" is in sale since Tuesday, July 18, 2017. This item is in the category "Garden & Patio\Hydroponics & Seed Starting\Grow Light Kits". The seller is "gardeners-corner39" and is located in Grimsby , Lincolnshire.